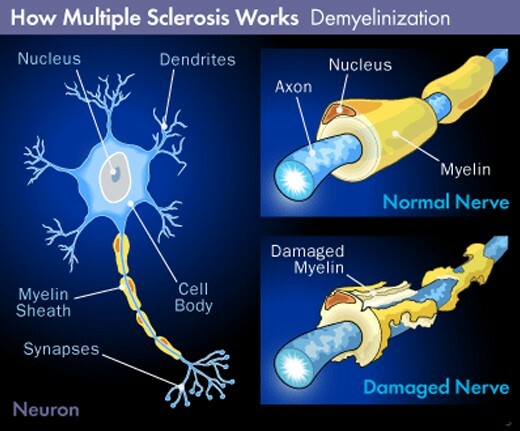 MS symptoms are variable and unpredictable. No two people have exactly the same symptoms, and each person’s symptoms can change or fluctuate over time. One person might experience only one or two of the possible symptoms while another person experiences many more. Occurs in about 80% of people, can significantly interfere with ability to function at home and work, and may be the most prominent symptom in a person who otherwise has minimal activity limitations. Related to several factors including weakness, spasticity, loss of balance, sensory deficit and fatigue, and can be helped by physical therapy, assistive therapy and medications. Numbness of the face, body, or extremities (arms and legs) is often the first symptom experienced by those eventually diagnosed as having MS. Refers to feelings of stiffness and a wide range of involuntary muscle spasms; can occur in any limb, but it is much more common in the legs. Weakness in MS, which results from deconditioning of unused muscles or damage to nerves that stimulate muscles, can be managed with rehabilitation strategies. The first symptom of MS for many people. Onset of blurred vision, poor contrast or color vision, and pain on eye movement can be frightening — and should be evaluated promptly. People with MS may feel off balance or lightheaded, or — much less often — have the sensation that they or their surroundings are spinning (vertigo). Bladder dysfunction, which occurs in at least 80% of people with MS, usually can be managed quite successfully through dietary and fluid management, medications, and catheterization. Very common in the general population including people with MS. Sexual responses can be affected by damage in the central nervous system, as well by symptoms such as fatigue and spasticity, and by psychological factors. Constipation is a particular concern among people with MS, as is loss of control of the bowels. Bowel issues can typically be managed through diet, adequate fluid intake, physical activity and medication. Pain syndromes are common in MS. In one study, 55% of people with MS had “clinically significant pain” at some time, and almost half had chronic pain. Refers to a range of high-level brain functions affected in 50% of people with MS, including the ability to learn and remember information, organize and problem-solve, focus attention and accurately perceive the environment. Can be a reaction to the stresses of living with MS as well as the result of neurologic and immune changes. Bouts of depression, mood swings, irritability, and episodes of uncontrollable laughing and crying pose significant challenges for people with MS and their families. Studies have suggested that clinical depression — the severest form of depression — is among the most common symptoms of MS. It is more common among people with MS than it is in the general population or in persons with many other chronic, disabling conditions. There have been very successful results for treating the symptoms of MS for patients who have failed conventional treatments with IV Ketamine Infusion Therapy. Dr. Ashraf Hanna recommends first following your recomendations for conventional MS treatments, but if patients do not see improvement, then the patient may be a good candidate for IV Ketamine Infusion Therapy.